Slowly awaken your senses while watching the sunrise on the beach. Watch the sun peak above the horizon; hear the ocean waves lapping along the shore as the sun warms your soul. There is no better way to start the day! Start your day with a hot coffee and pastry at a local breakfast spot. Stroll through the majestic Elizabethan Gardens that serve as a living memorial to Queen Elizabeth and the first English colonist in the New World. Discover the beauty and tranquility of the gardens, which offer seasonal colorful displays. Dine on the Manteo waterfront then explore Downtown Historic Manteo. Recently voted as one of the 10 most romantic towns in NC. This quaint town is full of independently owned shops, eateries, and businesses that offer one of a kind items such as handmade pottery. Watch the sunset from Jockey’s Ridge State Park. Jockey’s Ridge State Park is home to the largest living sand dunes on the East Coast. It overlooks both the sound and the Ocean offering spectacular sunset views. Delight your palate with the flavors of the Outer Banks. Try some of the fresh local seafood the Outer Banks is known for. Don’t forget to grab a bite before you hit the (really) open road. 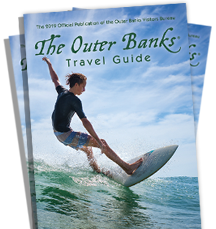 Take a drive down the Outer Banks Scenic Byway. Wind your way past sandy dunes, a wildlife refuge, and famous surf spots. Along the way look for the beach home featured in major motion picture Nights in Rodanthe, based on the best selling romance novel by author Nicholas Sparks. Explore the villages on Hatteras Island. Shop, eat, and explore your way through Hatteras Island’s seven charming villages. Discover each one of the village’s unique flair. Pack or order a box lunch and have a picnic on the Cape Hatteras National Seashore. The Cape Hatteras National Seashore has been ranked one of the Best Beaches in America by Dr. Beach for 8 years in a row. Visit the tallest lighthouse in the country, the Cape Hatteras Lighthouse. Located in Buxton, it has been a beacon of light in the darkness for over 140 years. Recently ranked one of “The Most Beautiful Lighthouses in America”. *Have 4 wheel drive vehicle? Take a romantic drive on the beach to find a secluded spot or explore the underdeveloped beaches of Hatteras Island on horseback with Equine Adventures or Hatteras Island Horseback Riding. Take a stroll along The Duck Boardwalk as it winds its way past fine retail establishments and eateries. Rejuvenate your mind, body and soul with a couples massage at a local spa. Rent a privately chartered sailboat for a romantic evening cruise along the sound.